Every bride has a long list of things to do before a wedding, but few are as high priority as choosing a dress and bridal jewelry. 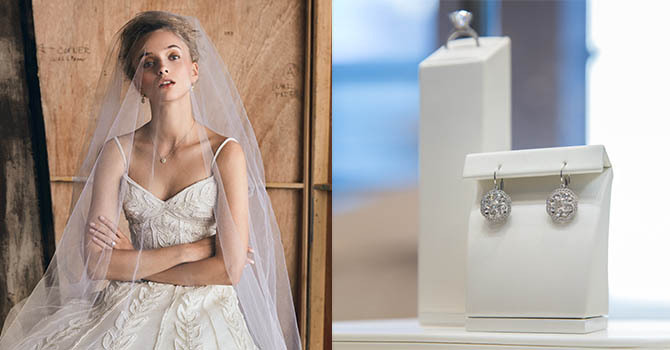 Tiffany and Moda Operandi have teamed up to try and help make the process easier by presenting a capsule collection of fashion forward wedding gowns and dazzling diamond jewels. 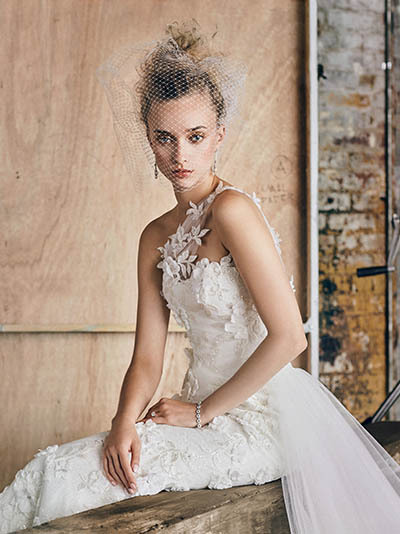 The runway ready looks are sure to inspire great ideas for your walk down the aisle. Here are five of our favorites. See the collections for yourself at the newly renovated Tiffany on Rodeo Drive in Beverly Hills from October 28 to the 29, 2016. It will also make an appearance at the Tiffany in Toronto-Yorkdale, Canada from November 11 to the 12th, 2016. 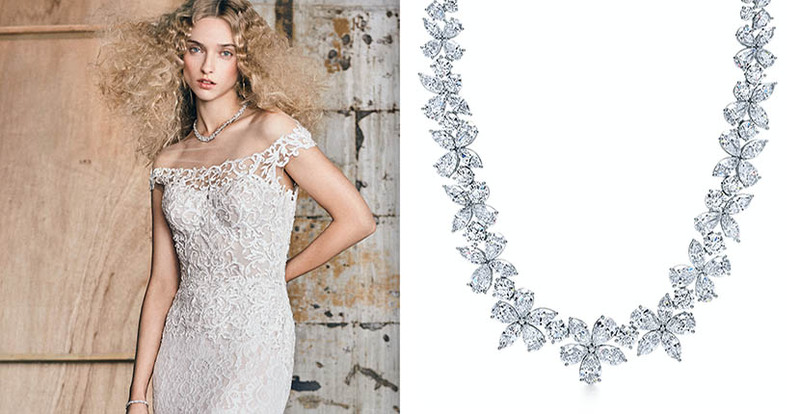 The elegant model in the photo above is wearing an off the shoulder lace Reem Acra gown accessorized by an amazing Tiffany necklace of pear, round and marquise shape diamonds set in platinum. A Tiffany Victoria platinum and diamond bracelet and earrings finish off the chic ensemble. The sleeveless silk Delpozo gown with deep v-neckline and the eye-catching bow in the front on the model, above right, is lit up with a long Tiffany Circlet diamond and platinum necklace and a choker length version of the design. Sparkling out from under the models blonde mane are platinum and diamond chandelier earrings suspending three diamond drops. A deluxe diamond bracelet is shining on her wrist. One of the limited edition 130th Anniversary Diamond Pavé Tiffany Settings is on her ring finger. Read more about 130th Anniversary Diamond Pavé Tiffany Setting here. The romantic Sweetheart Foliage gown by Elizabeth Kennedy on the model above features floral thread work throughout. It is accented by bright yellow Tiffany diamonds. The model is wearing a pendant set with a 2.64-carat yellow diamond surrounded by white diamonds and mounted in platinum. Her pendant earrings have yellow diamond centers surrounded by a double halo of white diamonds. Beaming from the model’s finger is a classic Tiffany Setting engagement ring with a yellow gold band and a 2.50-carat diamond center held up by platinum prongs. The model (above left) wearing the Romana Kevez one shoulder gown with floral embroidery throughout and a glam train has on a Tiffany Cobblestone bracelet with diamonds set in platinum. Diamond chandelier earrings sparkle from behind her veil. A new Tiffany Setting engagement ring with a rose gold band sparkles on her finger. The model (above right) in a mermaid lace gown with a plunging neckline by Costarellos has on an exceptional wide diamond bracelet with 86.99-carats of diamonds. Her necklace is a classic Elsa Peretti Diamonds by the Yard platinum chain. One of the limited edition 130th Anniversary Diamond Pavé Tiffany Settings is on her ring finger.